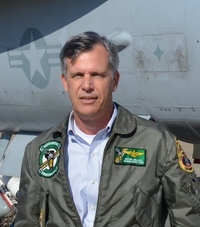 Captain Kevin Miller, a 24-year veteran of the U.S. Navy, is a former tactical naval aviator and has flown the A-7E Corsair II and FA-18 Hornet operationally. He commanded a carrier-based strike-fighter squadron, and, during his career, logged over 1,000 carrier-arrested landings, made possible as he served alongside outstanding men and women as part of a winning team. Captain Miller lives and writes in Pensacola, Florida. His first novel, RAVEN ONE, was published in June 2014 and peaked at #29 in Amazon's sales ranking. The sequel, DECLARED HOSTILE, was published in August, 2016. HIGH DESERT REFLECTIONS is an autobiographical short story of his flying experiences in the American mountain west. https://www.goodreads.com/book/show/2.. Captain Kevin Miller, a 24-year veteran of the U.S. Navy, is a former tactical naval aviator and has flown the A-7E Corsair II and FA-18 Hornet operationally. He commanded a carrier-based strike-fighter squadron, and, during his career, logged over 1,000 carrier-arrested landings, made possible as he served alongside outstanding men and women as part of a winning team. Captain Miller lives and writes in Pensacola, Florida. To ask Kevin Miller questions, please sign up. Kevin Miller Not very well! I should write daily - but often go days without it. Writing Raven One was a cycle of intense activity (10-15K words over a period of…moreNot very well! I should write daily - but often go days without it. Writing Raven One was a cycle of intense activity (10-15K words over a period of days) followed by weeks or months of inaction. Kevin Miller I'm not a marathoner and friends would laugh that I even compare myself to one, but publishing a novel is a long journey. Slow and steady and all…moreI'm not a marathoner and friends would laugh that I even compare myself to one, but publishing a novel is a long journey. Slow and steady and all that. It is a feeling of accomplishment and people appreciate it. I like it when they marvel at the world I show them; they had no idea, and through my words they learn. My publisher Stealth Books expects more intelligence from readers than what others with a business focus give readers credit for. We write for readers at a high level. Hang on. Kindle Countdown Deal underway for Declared Hostile! This is the third Raven One book the author has written on contemporary international relationship issues facing the United States. Central to the fictional story the author tells is how quickly incidents can spin out of control even with the best intentions by all to contain the incident. People hear and see what they want to see. The book starts with a well planned and executed attack carried out on a limited non-valuable target of opportunity that, however, results in an unwanted valuable target being hit. The consequences of the valuable target being unexpectedly hit results in repercussions far beyond what was hoped for. Mix into this event too much information, which is just as bad as too little information, particularly when non-verified information gets mixed with verified information being fed to the leadership who are trying to formulate a response, and things can go wrong, very wrong. The story line centers around a U.S. Navy pilot, Jim Wilson, and the part a U.S. Navy carrier group plays within the conflict. The writing is tight and accurately portrays the world of today’s Navy. The people encountered in the book are not cardboard persons, but instead are real people. Buried within the tales of the air and naval battles fought in the South China Sea are the foibles of human nature and of any large organization. Each nation’s attack plans crumble in action and must be modified and restructured in the heat of combat. Rewards and punishments for actions and non-actions taken are not always fair. The book ends with the leadership of both sides contemplating the results of the war that led to the death of so many sailors and airmen and the destruction of numerous ships and aircraft. The internal dialogue within both countries raises the question in the readers mind as to who were the winners and losers in this war. Did the United States really win the war or did they just score a tactical victory and suffer a strategic defeat? Did the Chinese lose the war or did they only suffer a tactical defeat but win a strategic victory? Does one take a short-term view of history or a long-term view of history? The heart of the book is summed up in a quote of Mao Zedong at the start of the book “Fight, Fight, Talk Talk, Talk Talk, Fight Fight.” Mao’s quote is an excellent summary of the European interaction with the American Indian from the first day Europeans set foot in North America. We know who won that 500-year war. Does Mao’s quote also sum up the current relationship between the United States and China as the author seems to suggest? We’d love your help. Let us know what’s wrong with this preview of Fight Fight by Kevin Miller. We’d love your help. Let us know what’s wrong with this preview of Prosperous Christian by Edward C. Hill. "Great read and awesome series starting the 3rd book right away. Great series thus far. Lots of detail and finger biting suspense. Real page turner Kevin Miller is a great writer with a knack for military fiction. " We’d love your help. Let us know what’s wrong with this preview of Declared Hostile by Kevin Miller.